Most of the vintage dance events around here say things like "Historical attire suggested but not required" or "..admired but not required". The problem is, what does it mean to someone who doesn't have the historical costume. Sure, it's not required, but what is? 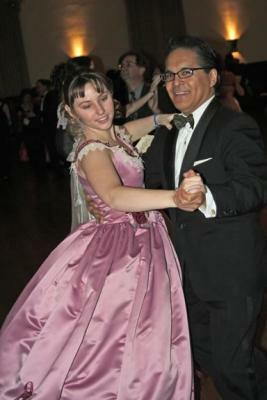 An observation made by the Social Daunce Irregulars on their website is that it is best, if you are not currently deeply into historical costumes, to NOT wear a costume to your first event, but take the opportunity to see what others are wearing and also see if you like this vintage dance stuff. It would be an awful shame to spend hundreds of dollars on a costume and (1) see from looking at others that it was a crappy costume or (2) decide that you don't really like this vintage dance thing after all, and you have now flushed hundreds of bucks down the toilet for a costume you will never wear again. Of course, this doesn't mean you should just show up in jeans and a tee shirt. With any event that describes itself as "formal", you should always make an attempt to dress nicely, even if you don't happen to have a period costume. This may vary depending on the event, but with nearly every event, a man in a coat and tie would not be out of place, nor would a woman in a long dress. For an evening event, a tux is always a good choice for a man. It's even easier if the event theme is 20th Century ("Art Deco", "Jazz Age" etc.). Formal wear has changed only in minor details since then, and tuxedos hardly at all, so any elegant attire (other than, perhaps, a mini-dress) will do fine. In all of these, for indoor events, feel free to leave your hats at home or take them off when you arrive. Neither ladies nor gentlemen should be wearing hats on the dance floor. In the final analysis, the key is to make an effort to add to, rather than detract from, a generally elegant tone for the evening - and if you do that, you'll do just fine.